The current political impasse in the North continues in the wake of two election campaigns which have been described as the “mother of all sectarian headcounts.” Both Sinn Féinand DUP have consolidated their positions as the largest political force in their respective communities. The current stalemate in terms of talks is a reflection of increased sectarian polarisation in society. This is reflected in the debate around the Irish language. 68.6% of nationalist voters do not believe there should be a return to the executive without a standalone Irish language act while 65.6% of DUP voters are opposed to the DUP changing its policy on the Irish language. There can be no doubt that the DUP has acted in a manner which has enraged Irish language speakers, such as the blatantly sectarian decision to cut the Líofa bursary scheme, which provides financial assistance to young people to attend Irish language courses in Gaeltacht areas, or the comments by Gregory Campbell in the Assembly ridiculing the language. Sinn Féin claims that they are pursuing a “rights-based agenda” when it comes to these negotiations. They may talk about Irish speakers’ rights and LGBT rights but they are silent when it comes to the right of women to choose. As Coretta Scott King once said, “freedom and justice cannot be parcelled out in pieces to suit political convenience. I don’t believe you can stand for freedom for one group of people and deny it to others.” For Sinn Féin this “rights-based agenda” is just “political convenience.” In reality they, like the DUP, are playing the sectarian game of being seen to be standing up for their community. 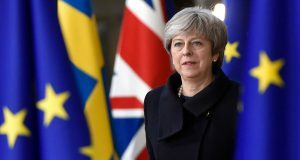 There are ways for these establishment parties to fudge a deal on this issue, such as the proposal that there should be three acts: an Irish language act, an Ulster-Scots act and a minority language act. The DUP, in particular, have been forced to cool some of the rhetoric that has enraged Irish language speakers and to be seen to engage in “dialogue” with Irish language groups. 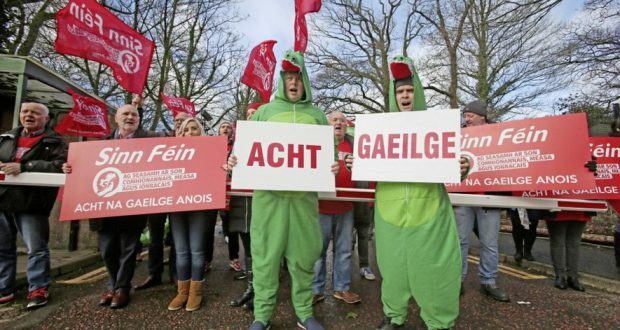 The Socialist Party supports legal protection for the Irish language, Ulster Scots and other minority languages. State funding should be provided to facilitate those who wish to learn and use these languages, as well as funding for the development of the cultural aspects of these traditions such as literature, music and dance. It is counter-productive, and indeed sectarian in nature, to allow languages to be pitted against each other and it necessary to oppose the degrading of any language – which happens with both Irish and Ulster Scots. To genuinely protect the Irish language, Ulster Scots and other minority languages, words must be backed up by deeds – education and community facilities must be protected. The cut to the Líofa scheme was not a one-off, and nor is it only unionist politicians that have been prepared to swing the axe at these services. Just two years prior to the Líofa cut, the then Sinn FéinMinister for Culture, Arts and Leisure, CarálNíChuilín, oversaw massive cuts to a number of Irish language service providers, some of whom were forced to close. It is also degrading for language to be used as weapon in a sectarian battleground. Languages are not the exclusive property of one tradition in Northern Ireland. As the work of people like Linda Irvine, who organises Irish language classes in East Belfast, has shown, there is a much richer history to the Irish language. Left in the hands of sectarian politicians, languages will not be protected. 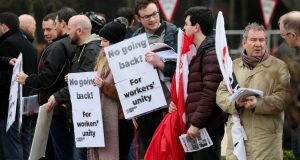 To genuinely defend and extend people’s cultural rights means building a new movement that can unite working-class people and seek to allow people develop their culture in a spirit of mutual respect and solidarity.